Infonomics is the theory; LINQ is the solution. Doug Laney’s book ‘Infonomics’ sets out an important reality: information is a critical business asset so start treating it as one! 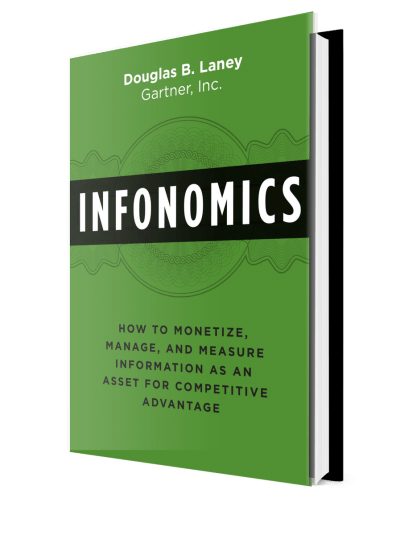 The principle behind Infonomics is that you must consider your information as an asset. Once you do this, you can measure, manage and monetise your information. This will enable you to mobilise your information to create new business value; you will be able to create new outcomes that impact your business and your customers, you will stay ahead of your competition and most importantly, your will ensure your business survives as the digital economy expands into all aspects of our lives. Business Executives; CEOs and other business leaders need to weild information as a corporate asset, CIOs need to improve the flow and accessibility of information and CFOs need to be able to the measure the actual and latent value of their information assets. The newer roles of Chief Data Officer and Chief Product Officer, plus individuals such as the Data Engineer or the Data Analyst can lead their organisations to infosavvyness! Measure – use a modern data catalogue to map information supply chains and build the inventory of information assets from all sources. Build Data Literacy through “information as a second language” to champion the underlying business value of data. Ensure communications span all business units to maximise the understanding and opportunity to innovate new business value. Manage – establish specific roles that focus on data, for example the new role of Data Engineer. Establish governance at a senior level, perhaps through the Office of the Chief Data Officer and define goals for new revenues achieved through the mobilisation of data. Monetize – understand the opportunity to apply your newly discovered information assets to generate more business value. Track business outcomes and benefits realised from this new approach. Extend your reach. LINQ enables Infonomics. By quickly enabling you to capture the Information Supply Chains which represent the discernible, discrete economic benefit in which information can be monetised, managed and measured, LINQ accelerates your move to become a data-driven business. Let your information flow! Understand where the blockages are and how to remove them. In the process, reduce the cost of information flow and increase the value of the outcome created. Gain insight into when updates need to happen based on value and criticality of source data. Ensure the right information is available to the right people at the right time. Get results faster! Reduce maintenance costs, cost overruns and delays in product creation. Identify the opportunity to create new product which meets customer demands. Understand how and where to automate processes which deal with repetative work, removing the human from the loop, avoiding rework, increasing quality of information. Increase customer acquision and retention, create new revenue streams through new lines of business, gain insight on how to enter new markets. Build long-term relationships with suppliers, partners and customers by better understanding their needs and delivering solutions ahead of your competition.